In November, I presented on digital badges to the University-Wide General Education Committee (UWGEC) that I am an advisory member for on behalf of the library. My colleague and I have finished our multi-semester course pilot where we used digital badges with content in the library's one-credit course for undergrads, and now we are looking to expand to greater campus and also gather faculty feedback. If faculty don't find value in digital badges, we won't get very far. The reason I chose the UWGEC committee to present to is because all new gen ed courses are required to explain how information literacy (and other critical skills) will be incorporated into their class. There were a few applications that came through where it seemed faculty were unsure of how to either include IL skills in the class or just how to describe how IL skills would be included in the class. We do have a list of the (soon outdated) ACRL standards to help guide instructors, but there are of course issues with the standards, aside from them not really being intuitive to someone who is not a librarian. Additionally, since we don't have a FYE program, incorporating IL skills at the Gen Ed level would reach more students earlier on. When badges can be embedded into courses, instructors can more actively understand IL concepts and skills that their students will need and map IL to current course design. Faculty were very excited to hear about this possibility of a mix and match digital badge option for including research skills in their courses. This wouldn't require much additional instruction time on their part, and everyone (faculty and the library) would have access to assessment data. Prior to this presentation, it felt badge talk on campus was stalled or even non-existent, but I found some interested instructors to become part of our Pilot Part II, and was also invited to another working group on campus to include digital badges in eportfolios (actually very similar to what UC-Davis has announced). We will be analyzing our data for these two semesters and then will be starting another pilot for spring if all works as planned and presenting on our findings at ALA Annual 2014 in Vegas. I don't think there is a date or time set yet but the title of our presentation is: But did they learn anything? 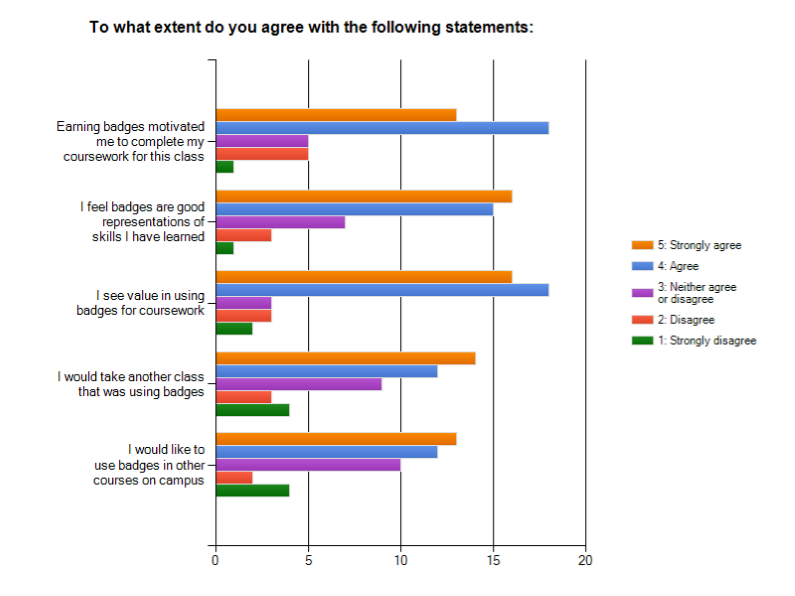 Using digital badges to create customizable learning experiences for motivation and assessment. Hope you'll join us! It will be an interactive session where audience members will start putting a badging system together for their institutions (and this is through LITA).